Travel Distribution World Thailand 2014 is the premier platform for the region’s travel and hotel leaders to gain insights into the strategies, innovation and technology driving the growth of Thailand’s travel and hospitality industry. This is the platform for showcasing technology and solutions that help travel and hotel suppliers and intermediaries to better navigate the unique sales, market and distribution dynamics in Thailand. 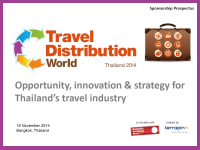 Then take this opportunity to educate Thailand’s travel and hotel industry on what your product can do for them! For more information, please contact Sharon Yang on +65 6322 2727 or sharon.yang@terrapinn.com .